Reports of suspected palm oil deposits on Thanet’s beaches have been received this week and the council is alerting people to its potential dangers and erecting warning notices in those areas affected. These unknown white lumpy substances have been occurring more frequently following winter storms over the last couple of years, and may be better described as ‘mineral and vegetable oils’ – as palm oil is only one type. Dog owners are advised to please keep your dog on a lead if visiting the beach. This substance can also be harmful to dogs if eaten. The deposits are a waxy substance, yellowish/white in colour and smell like diesel/firelighters. 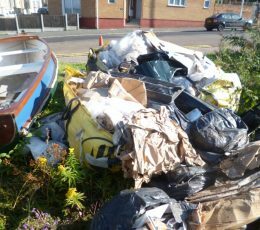 Council officers are currently inspecting Thanet’s coastline and cleansing teams have been alerted should there be any deposits. If anyone comes across what they expect to be palm oil or any other harmful substance, please contact the council with as much information as possible – location, photo, size/quantity, and if it has been removed from the beach. Any sightings should be reported to the council on 01843 577000.